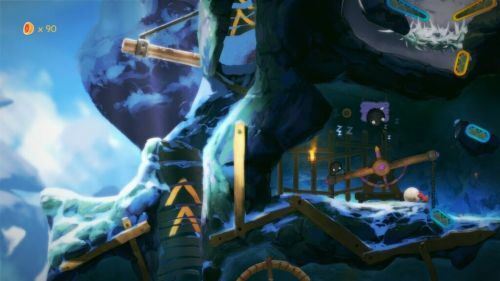 Pinball and Metroidvania is not a common mashup but Yoku’s Island Express captures the essence of these two in great and creative ways. The mechanics and puzzles work well and the performance holds up most of the time. With a whimsical and soft aesthetic the game is inviting and makes you want to explore. There are a good number of quests and secrets to uncover and the gameplay holds up the entire time. Yoku is the island’s new postal worker and for some reason he has a pinball strapped to him. It’s not important why but be thankful since flicking this ball is the only way he can get anywhere. Yellow and blue flippers are littered throughout the world and each is controlled by one of the controller’s triggers. This makes up the majority of how the platforming and traversal works. The dual genre mashup doesn’t stop there. Keeping in line with pinball you will come across mini ‘tables’ so to speak. These are somewhat circular zones with proper flippers on the bottom. In here you are playing on what is essentially a themed pinball table as you try to unlock exits, smash into enemies, or whatever other objective before progressing forward. There are even tables that will incorporate mechanics such as multiball and boss battles. On the other side of the genre bend you will need to collect new powers in order to properly progress through the story. Some powers will allows you to create small explosions, while others give the ability to swim down into deep water, etc. True to the Metroidvania core, you will be returning to previous areas many time in order to find new secrets and complete quests. The two different genres work together surprisingly well. For the most part the game runs very smoothly until you unlock the faster travel ability. Since this basically shoots you around the map in real time, it has to render everything as you fly. This would often cause the game to hitch up and freeze as it needed to load the next area. An annoyance for sure but a small price to pay for a lack of load times anywhere else. The game is set on Mokumana Island and the different environments and characters are all a treat. There’s a soft painterly aesthetic to the game that, when paired with the bizarre characters gives off a real Double Fine Productions vibe (specifically Broken Age). You will meet giant dragon-like worms, sword wielding cultists, and a gross maggot-like society to name a few. This also means that you will pinball your way through a lot of different locations. High, snowy mountains, dark and flood ruins, and lush jungles are only some of the areas. There’s a lot to see but the game makes it worth it. With all this, it’s a relief that the map system is actually really well done. Like any Metroidvania, you will need to work your way back and forth across the world. This time it’s a maze like pinball structure. The map system allows you to zoom in and move around in great detail. Almost every objective to pointed out to you while others will rely on not-too-difficult hints. When trying to collect the final (and numerous) collectables, you can purchase maps that will point out the exact location while leaving you to figure out how to fling yourself there. Mokumana Island is easy to get around and encourages you to do so repeatedly. Yoku’s Island Express is a huge question mark of a concept that it brilliantly executes on. 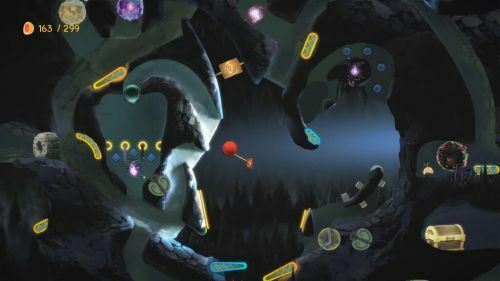 The maze like structure of a Metroidvania world melds perfectly with the winding and twisting structures of a pinball table. Incorporating boss fights and multiball are just two fun examples of furthering these genres’ footing. You will want to explore every inch of the island and the useful fast travel and wonderful map makes it easy to do so. Don’t skip on this little gem.